Load testing is critical in preventative maintenance programs, especially in the motive power industry. If your forklift is under performing, battery failure may be the culprit. By regularly testing and monitoring your forklift batteries, you have the potential to decrease downtime, optimize your forklift's batteries, save money and improve the company's ROI. 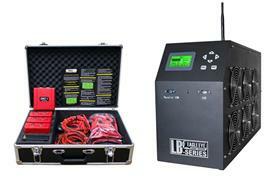 Eagle Eye's SLB-Series Smart Load Banks are the industry-leading discharge solution for forklift battery testing. They are portable, safe and the most reliable way to measure battery capacity. Our motive power specific SLB-24/36/48-300 & SLB-24/36/48/80-200 Load Banks come standard with wireless monitoring of the system during discharge testing. Our optional data acquisition case add-ons allow for wireless monitoring per battery cell during discharge. As a result, the voltage of each cell will be displayed and recorded which allows for the health of each cell to be evaluated individually. The management software included with each load bank allows for the user to create reports, trend system/cell health, create discharging graphs. All reports are exported to Microsoft Excel or Word and can be customized by the user. This saves time and money by significantly reducing labor hours and replacement costs. In addition to our SLB-Series Smart Load Banks, Eagle Eye carries the LB-Series Constant Current DC Load Banks. They are portable, economic, reliable and user-friendly. 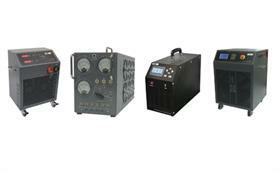 The LB-Series CC Load Banks are designed for battery capacity testing, acceptance testing, battery maintenance, and other testing of DC systems. The intelligent technology allows a constant current discharge without the need for any adjustments during the test. Previously used parameters are automatically saved after powering off the machine with three setting to auto-stop the discharge. The three settings include: 'Test Time', 'End Voltage' & 'Exceed Capacity'. In addition, an alarm will sound and end the discharge in the event of overheating, an abnormal disconnection of the battery, or if improper polarity is detected. The equipped cooling fans continue to run automatically after each discharge test to ensure maximum heat protection and prevent overheating. Load testing is a fixture in IEEE (450), (1188), (1106) and NERC (PRC-005-2) battery maintenance standards, and is critical for preventative maintenance in the motive power industry. The financial risks that can occur due to plant downtime, personnel safety, and serious equipment damage are too severe to ignore load testing. Every six calendar years it is required by PRC-005-2 to complete a capacity test of the battery bank for Vented Lead Acid (VLA) and NiCad batteries, and every three years for Valve-Regulated Lead-Acid (VRLA) batteries. Interested in training? Visit us on www.eepowersolutions.com for information about our training courses for DC Power Systems. This two-day course covers the theory and design of the DC power systems that are typically used in standby applications. It is intended for any personnel involved in the specification, procurement and installation of DC power systems. 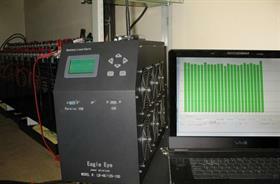 Eagle Eye Power Solutions is the industry leader in critical battery testing, monitoring & charging solutions! We are committed to offering the best products, education, training and support services to our customers worldwide. Call us at (877) 805-3377 to receive a formal quote or support in any of our products or training courses! Download our motive power 2017 catalog here. Eagle Eye Power Solutions is committed to offering the BEST products, education, training and support services to our customers! 100% customer satisfaction is our guarantee and the foundation upon which our company is built. 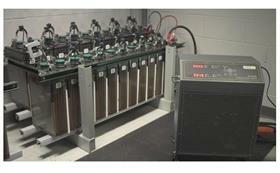 Our mission is to lead the industry in battery testing education, training, products and support. Being the industry leader in battery monitoring and battery testing solutions requires outstanding products, support services and overall value, so that every customer is 100% satisfied with their EEPS experience. We are committed to promoting and contributing to a cleaner, greener, and safer environment. We strongly believe in and practice energy conservation methods as well as recycling.